You are currently browsing the archives for the tag 'abayas'. A hijabista is the Muslim equivalent of a fashionista, a trend-loving Muslim woman or girl who dresses stylishly while conforming to the Islamic modesty code. This market is still untapped but for sure very lucrative. Muslim shoppers spent $266 billion on clothing and footwear in 2013 according to a report by Thomson Reuters. That’s more than the total fashion spending of Japan and Italy combined and the number is expected to almost double to $484 billion by 2019. 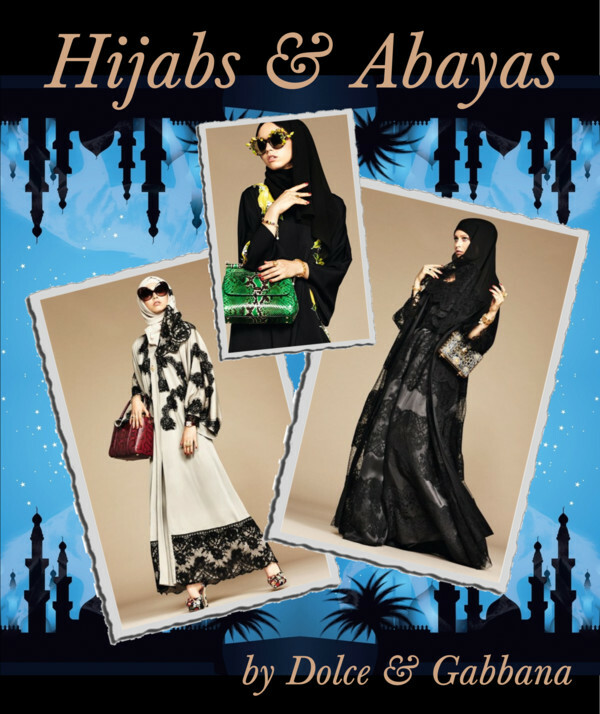 Dolce & Gabbana has realized the potential and is launching a collection of hijabs and abayas for their Middle East customers. The modest garments have all the flair and iconic details such as lace or prints of any other Dolce & Gabbana collection. They are styled alongside the label’s fantastic accessories like fashion jewelry, oversized sunglasses, and statement bags. I am absolutely convinced that Muslim customers with a taste for luxury fashion will adore this new line. It will be interesting to see if the collection will only sell in the Middle East or if online platforms such as NET-A-PORTER, MATCHESFASHION and LUISAVIAROMA will take this opportunity as well.